Bose Corporation known for their audio quality have launched three variants of its SoundTouch systems, that let you stream music wirelessly in any room. You can control these speakers using an App which has been made available for Android, iOS, Windows platform. The Sound Touch systems will stream music using your home WiFi network. 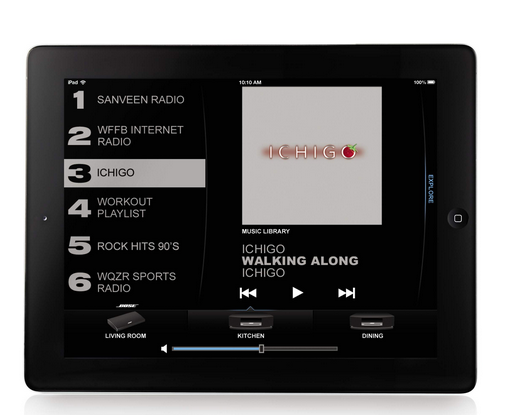 SoundTouch music systems are also AirPlay enabled, so owners can stream content from their iPad, iPhone, or iPod Touch. Three SoundTouch system models have been launched today. The SoundTouch 30 Wi-Fi system features exclusive waveguide technology and a new proprietary woofer. The SoundTouch 20 Wi-Fi system is more compact. It offers natural, room-filling sound and can be placed almost anywhere. The SoundTouch Portable Wi-Fi system combines full-range audio and a rechargeable, lithium-ion battery in a speaker no bigger than the average book. The SoundTouch app is quite easy and simple to operate and you can also operate the system by a simple button push or by a remote. Bose plans of bringing SoundTouch system to other Bose products like Wave music system, Stereo JC Wi-Fi, home theater systems and the VideoWave entertainment system by later next year. The SoundTouch 30 system will be sold for INR 52763; the SoundTouch 20 system will be sold for INR 32512 and the SoundTouch Portable system will be sold for INR 32512. All these products will be available for purchase starting from mid November next month.